If you have a Stripe payment gateway connected to Populi, you can enable recurring donations and payments. If you haven't already, sign up for Stripe (if you have, jump to the next step!). Go to Financial > Settings > Payment Gateways. Select Stripe as a provider. Click Connect to Stripe. Fill in the signup form (or log in with an existing Stripe account). Once you save, it will automatically connect to Populi. Check the payment methods you wish to enable for this gateway. 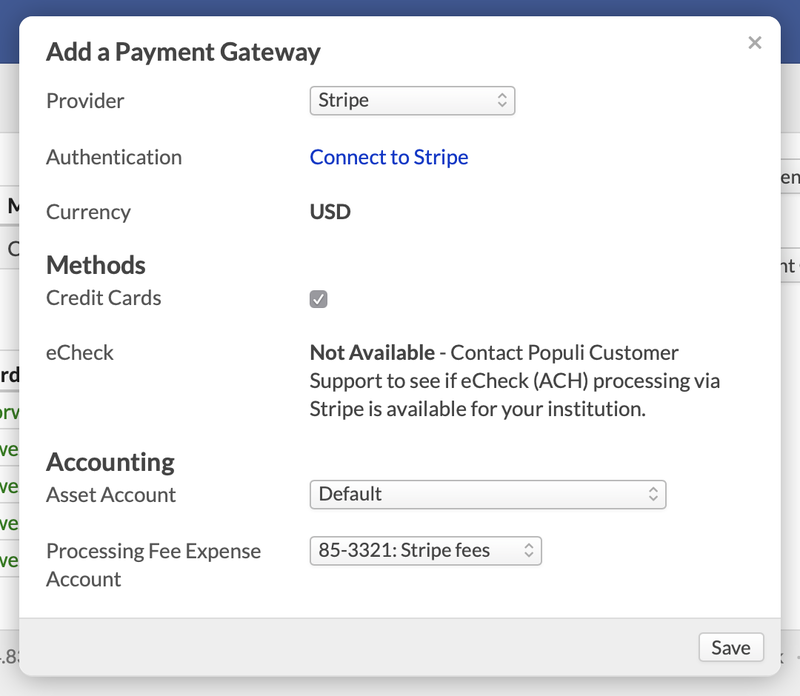 If you'd like to accept e-checks and ACH payments through Stripe, please contact Populi Support. Finally, click Save to add your Stripe gateway. You can specify which payment gateway you wish to use for different kinds of online payments. For recurring donations and payments, you need to specify Stripe as the credit card and echeck gateway for the Tuition & Fees and Donations uses. For recurring online payments, select Stripe under both credit cards and echecks next to both Tuition & Fees. For recurring online donations, select Stripe under both credit cards and echecks next to both Donations. You cannot mix Stripe and Authorize.net gateways for any use for which you'd like to enable recurring payments! Go to Donations > Settings > General. Scroll down to the enable recurring donations setting. (Optional): enter the text of the email you'd like sent every time the recurring donation is charged. Scroll back up and click Save Settings. You can disable recurring payments for specific donation pages by going to the page's settings and un-checking allow recurring. Go to Financial > Settings > Online Payments. Scroll down to the enable recurring payments setting. (Optional): enter the text of the email you'd like sent every time the recurring payment is charged. After enabling recurring donations, your donors who visit one of your online donation pages will have the option to make this a one-time donation or to give this amount monthly. If they choose monthly, they can then elect to make the monthly donation every month until they cancel or to make it a fixed number of times (you can also set up a recurring donation when you process a donation on the donor profile. 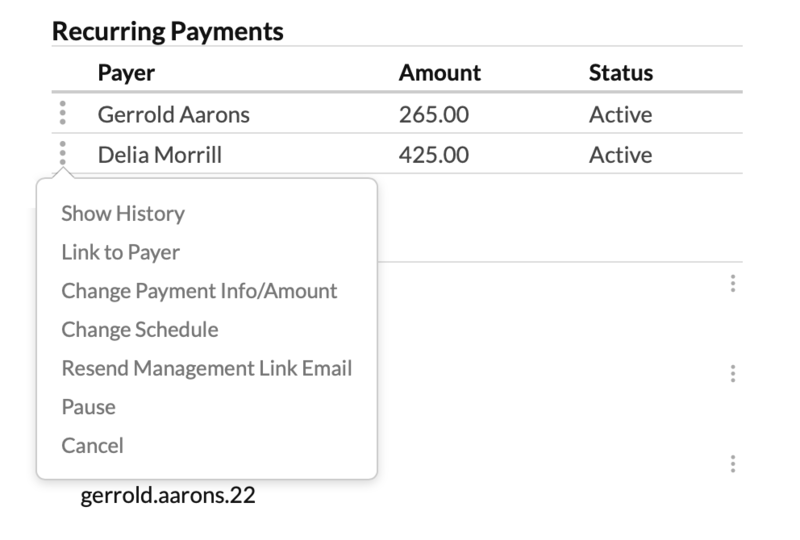 After enabling recurring payments, payers who go to the payment page will likewise have the option to make this a one-time payment or to pay this amount monthly as long as the student has an amount due. The payer can elect to make the monthly payment every month until they cancel or to make it a fixed number of times. If you've enabled the Online setting for a particular payment plan, students can choose it when they go to pay their invoices on the online payment page. You can find a list of all recurring payments in Billing > Recurring Payments. You can find a list of all recurring donations in Donations > Recurring. If a donor has set up recurring donations, you'll see the Recurring Donations panel on Profile > Financial > Donations. Likewise, if a student has set up a recurring payment—or a third-party payer has set up a recurring payment on her behalf—you can find them on her Profile > Financial > Dashboard. In either place, click to see your options for managing the recurring donation or payment. Recurring Payment is a great function! Thank you for adding it to the system. I do have a request/suggestion. 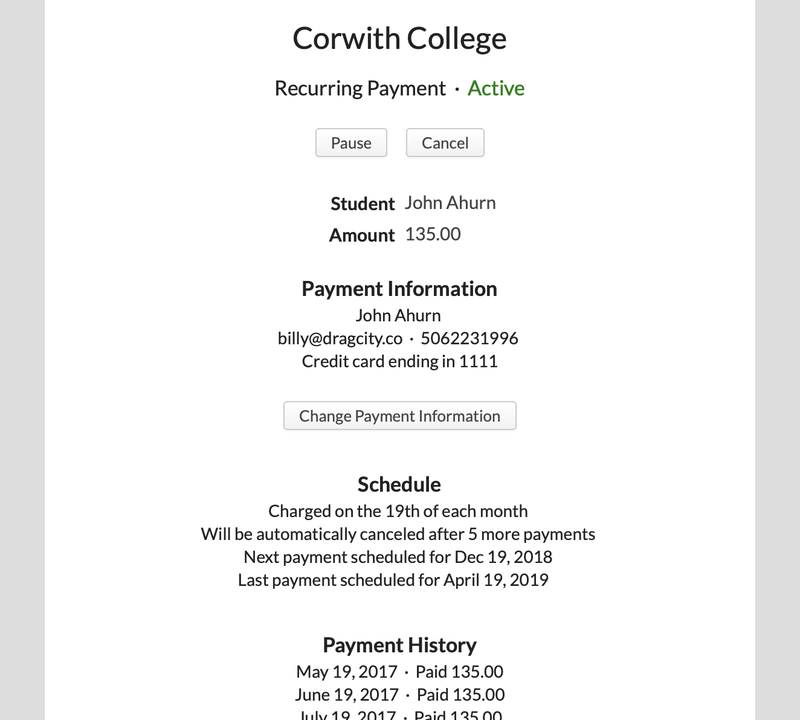 It would be helpful if the Recurring Payment could be set-up by the student to start on a future date rather than at the time of the first payment. I noticed that there is the ability to change the day of the month after the Recurring Payment has been established. I would assume that it would be possible to have the ability for the student to select a future date for the Recurring Payment to begin.